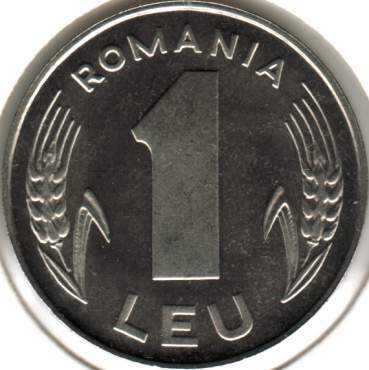 denomination "1 LEU", ROMANIA, wheat ears · ROMANIA ·, Romanian coat of arms, year 1992, oak leaves. Along the rim (at right) lies CD standing for Constantin Dumitrescu, the engraver's name. Above the pictures of a nickel pattern of 1 leu 1992 are presented. As you can see, the obverse is significantly different from the obverse of the 1 leu coin which entered circulation in 1993. Silver patterns exist also. The pattern pictures above are present on Romanian coins through the kind permission of Mr. Radu Lissner. This pattern is usually put in relation with the name of professor Anghel Rugină, renown American economist of Romanian origin, honorary member of the Romanian Academy since 1990. 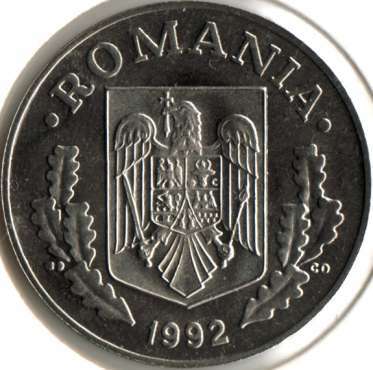 Professor Rugină proposed, immediately after the Romanian revolution, besides some economic measures, a monetary reform introducing precious metal coins into circulation (thus having intrinsic value). This reform was intended to assure a stable economy and the end of the post-revolution economic crisis.